Can I Use a Kitchen Faucet in the Bath? Many attractive kitchen faucets have features you don't normally find on bathroom faucets, including swiveling spouts and attached spray hoses. While there is no design rule that prohibits using a kitchen faucet in the bathroom, it must be a physical match for the sink. You may be able to install your favorite kitchen faucet in the bathroom without a hitch or you may have to modify the sink. Kitchen faucets can have one handle or two, depending on the type of valve mechanism inside. The supply tubes for single-handled faucets connect to the faucet near the base of the spout, and when you install the faucet, you feed both tubes through a common hole in the center of the sink. Double-handled faucet supply tubes, on the other hand, often connect to the handles, which are spaced 8 inches from each other. If the handles are attached to the faucet body, this spacing cannot be changed. Some faucets have flexible hoses to connect the handles to the spout, allowing you to change this spacing. Bathroom sinks come in a variety of shapes, and they are usually made of plastic, metal or porcelain. When the holes for the faucet are pre-made, the spacing between them is usually 4 inches. You can buy bathroom sinks with one central hole for installation of a single-handle faucet or without any holes at all so that you can make your own. The back rim of a bathroom sink is usually smaller than that of a kitchen sink, and it curves with the contours of the sink, making it inappropriate for a larger faucet. The determination of whether a kitchen faucet will fit on a bathroom sink depends on the type of faucet, its shape and the spacing of the holes on the sink on which you want to install it. 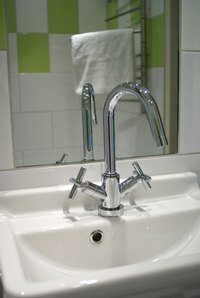 A single-handle faucet won't work, even with an appropriate hole in the sink, if the base is rigid and the wrong shape. Similarly, a double-handle faucet with a rigid base won't work on a porcelain sink with pre-made holes. The kitchen faucets most likely to work in the bathroom are single-handled models with a small base and double-handled models with flexible hoses connecting the handles to the spout. Don't try to modify the holes on a porcelain sink. The sink will probably crack before you make any headway with your drill. If you decide to modify the holes on any other type of sink, make sure the faucet fits on the rim before you do. If the base hangs over the edge, it is not only unsightly, it also makes the faucet unstable. If the spout swivels, measure its length and compare the measurement to the sink dimensions. If the spout is too long, it will hang over the counter.